WordPress is a blogging software programmed in PHP language. Over the last 5 years, WordPress has become the world’s most used CMS/blog software on the earth. 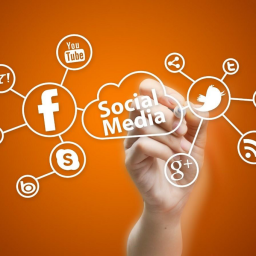 Whether, you want to start a blog, website or ecommerce store. WordPress has real flexible features to let you design your website as per your needs. Since last 10 years, there are 74 million websites are designed using WordPress. Several freelance web designers/programmers are offering their WordPress design services. Mostly these services costs you so much. WordPress is not as much difficult as to ask professional web designers/developers to do setup sort of things. 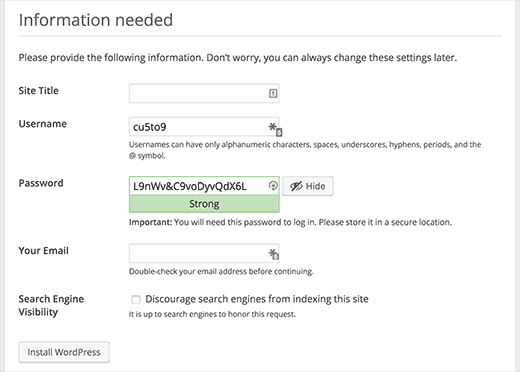 Here are the simple steps to follow, if you want to install and configure WordPress on your own. First of all if you want to install WordPress yourself, you need to arrange couple things before installing WordPress software. Here are the things needed to be ready, so you could go ahead with installation process. A Domain – You need to buy a domain name for your website or blog. If you already have a domain name to use, then it’s OK. Otherwise you can buy domain names from Godaddy (My Favourite Domain Registrar). Godaddy domain registration costs around $12.99/month. Web hosting – This is a small portion of disk space on a remote server. You can buy web hosting for few bucks from the following links or search your own. Blue Host , Hostgator or SiteGround. FTP Software – An FTP software is used to transfer files from your local computer to the remote web server. You can download FTP software Filezilla for free. Latest WordPress Software – You can download WordPress software free of charge from the following URL. When you are ready to install WordPress on your web host, Follow these steps to start with WordPress setup. 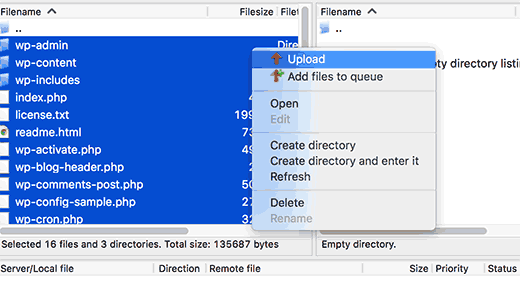 Unzip the WordPress software zip file to your local computer. Open FileZilla application and put FTP Username, Password and host address like in the screenshot below and connect. 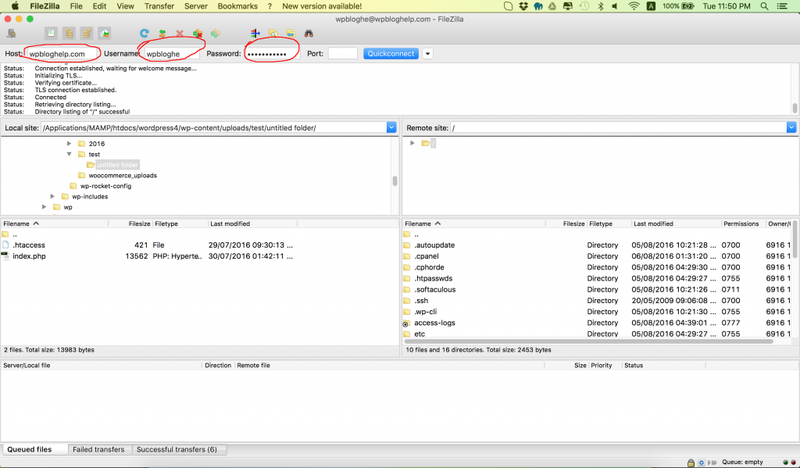 Once your FTP software connection is established to your server, FileZilla will be showing some directories from your remote server in the filezilla middle-right part of the screenshot above. Now select the directory on your server named “public_html” and on left side. You can also point to the directory with unzipped WordPress. Now select all local files from left side and “Right Click” and then select “Upload”. This process will upload files to your web server. 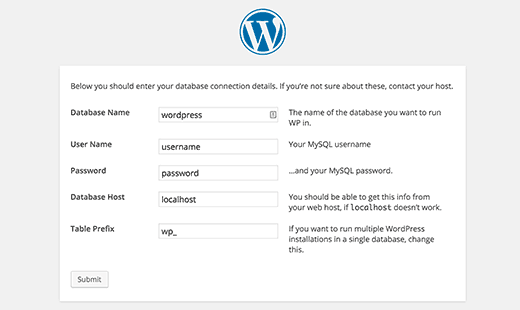 We need to setup database for your WordPress installation. To create a new database on your server, You should login to your web hosting control panel (Web hosts send login details when the purchase is complete). On your web hosting control panel, you need to point to the icon shown in the screenshot below. And click that icon to create a new database on your server. Now proceed to the screenshot given below to create a new database. Remember to use on alphanumeric database name. Now create a database user from the same page, which is used to created database. In addition to database and database user creation, You need to add database user to database and give appropriate permissions like the image shows here. Now open your domain in your favourite browser. You will see screen asking you to start WP configuration. The process starts with the installation language selection. Select your language and click “Continue” button. Next step of installation wizard asks you to see if you have appropriate database login details. Click “Let’s Go”. Put database host, user, pass and database name and click the “Submit” button. It will start installing the WordPress software automatically. 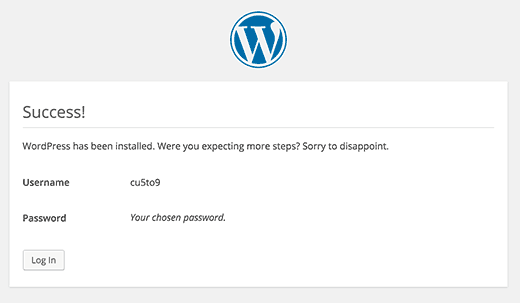 After the WordPress is installation is complete, it will ask you to fill out the following information. Finally the installation process is complete now and you are ready to login to your WordPress admin control panel. Hence WordPress software is easy to install on web servers. People pay lot of money to WordPress developers and designers. This tutorial walks you through the process of WordPress setup. I hope, this tutorial and screenshots will help newbies to start installing and configuring on their own hosts. Bruce is an enthusiast web designer and programmer. In his last 17 years of web programming experience, he discovered that WordPress can change several business in the world of online marketing. He started blogging and helping people to make most out of WordPress. Thanks Linux.ca, this encourages me to publish more contents which are helpful to people newly joining blogging sphere. Awesome post for newbies like me. 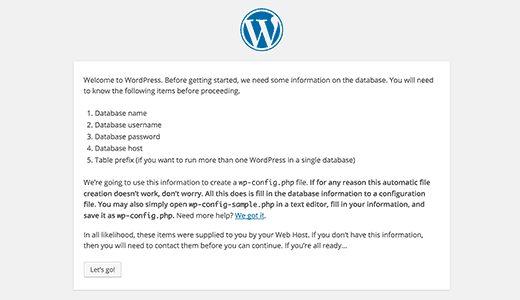 I tried this method and installed WordPress on my cPanel web hosting. 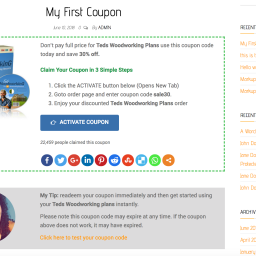 This let’s me quickly setup my WP blog from scratch and publish posts. Thanks Craig, please never hesitate to ask me if you need further information about your blog promotion as well. I will try to answer your questions asap. I was able to install and start my new WordPress blog using FTP to my Windows server. Yep that method works for all types of servers. Actually when you use FTP, you can FTP to any sort of web server which has installed FTP server as well either you talk about linux or windows. Yeah, I was able to install WordPress on my server using Fantastico and finally I am able to install it on my company’s server where fantastico is not available.